Looking for suggestions regarding the best rig for a small landscaping business. The rough critera is the smallest tractor setup (meaning turning radius/wheelbase/lenght) that can move 1500 lb pallets of rock, power a backhoe with a 7ft dig, and have options for a quick attach front bucket / forks / etc. I'm thinking along the lines of a Kioti CK30HST , but would really like something smaller if I could find it. BTW, even considered an articulated PowerTrac 1430...but not real comfortable with being locked into the limited and fairly expensive impliment options. Anyway, all suggestions and opinions welcome and appreciated. As with most things in life, when you get a do-all machine, it will do everything, it's just not the best thing for any given task. With combination, comes compromise. If you want a tough but small machine get a B or BX Kubota, or the similar model from another manufacturer. However, if you want 1500 pallet moving, and 7 foot backhoe abilities, then you don't want something that small. Your best bet for success and happines with the machine is to get what will do the vast majority of your tasks and either rent or hire a machine to do the other portion. I guess I might consider a skid steer or mini skid steer. The largest ram rod might carry your pallet and dig 7ft or more. I can not see a Toro Dingo with that large of lift capacity. I guess I look this way as the landscapers I bought my tractor off were looking in this direction. I have a friend that uses a Ram Rod in his stump grinding business and loves it. Yes, I agree a skid steer might be worth considering, are they real hard on grass or is it more a matter of operator skill? Yep.. it's all a compromise, and hard to get around the laws of gravity when it comes to things like lift capacity. So I know I need to go heavier, just would like to stay as "compact" as possible. A skid steer likes to slip to turn so it is very rough on finished lawns compared to a compact tractor. Its a little rougher than a CUT in 4wd on grass. To avoid damage you make super wider gradual turns. It also will mark up paved drives pretty bad also unless you put some sand down so it can slip. The tire marks will be there for months ++. done that! That said a skid steer has got to be one of the favorite tools of landscapers for work that is done prior to a lawn going in. Putting a rock hound on the front is great for leveling out lawn areas. It all depends on what type of work you will be doing, rough prep work skid steer, combination with traffic over finished areas CUT might be better. dont know how small with that lift cap. look into a jd TLB 110 a reversed enginered back hoe with a 3pth. I am not sure how the Ram Rods tare things up. My friend is on lawns all the time. It is certainly the lightest rig that would carry the load. But not too quickly. Bobcat makes a rig that steers all four wheels to reduce the slipage. Naturally we are talking radically different price scales. With the items listed on the "to do" and if you are going into business, I'd suggest both a skid steer and a CUT. A skid steer is more rugged for some of the jobs and has the lift capacity on a loader. The CUT is more agile for finish and smaller work. To start with I'd find some used equipment. I'd put the backhoe on the CUT and purchase a tractor with loader that is quick attach and compatible with the skid steer so you can use some of the same stuff. You won't be spending all your time attaching implements and if there is more than one of you working, you're both making money. The T4000 Tructor is a rugged Off-Road vehicle with a Kubota 4 Cylinder Diesel engines, Sauer Danfoss hydrostats and Dana Spicer axles. Adding ballast in the dump box increases traction on slick surfaces. The down pressure feature on the 3 Point Hitch improves the penetrating efficiency of post hole diggers, box or blade scrapers, aerators, turf pluggers, landscape rakes, soil sample probes, and other ground engaging implements. That T4000 looks pretty neat... way over my budget at $35K, but if they made a half size version, might be real interesting. 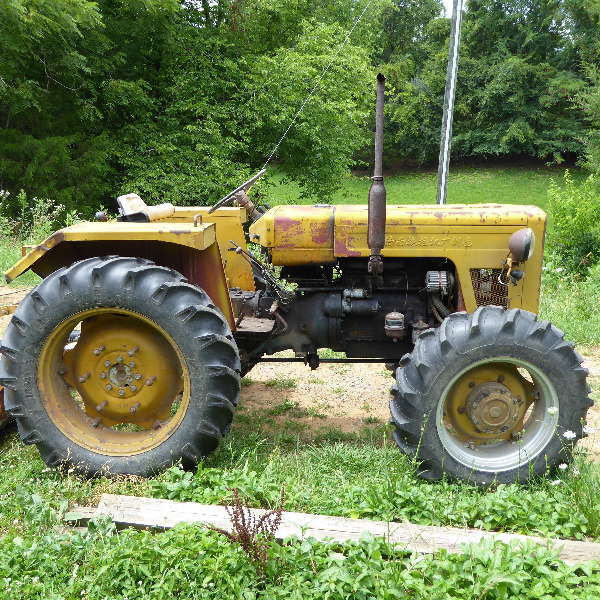 I'm going to look at some smaller CUTs, I might just start with a smaller tractor (20 HP) and then get a second larger tractor as has been been suggested by others, once the business is established.